The beach in Nice, France is made of small rocks, not sand. I took a walk in hopes of finding some sea glass and found it right away. I had less than an hour to look and I filled up two glass jars about 2 to 3 ounce in size. I found about 100 pieces. The glass is mostly green, but I found some blue, white, orange, amber, and one red piece. They are mostly frosted with smooth edges, but some had sharper edges. I could have spent days on this beach. The sea glass is everywhere! Just walk along the beach anywhere along the Promenade Des Anglais. I have very tough feet, but even I could not handle the rocky beach without wearing something on my feet. Pool shoes would be perfect, but I just bought a pair of flip flops and used them. You can walk anywhere along the beach just where the tide recedes and sea glass is visible. With a little bit of digging you can come up with some finds that are larger than what's lying on the surface. The beach is public and access to any part of the beach is easy. Sammi, I hope your daughter was able to come back with some sea glass for you. 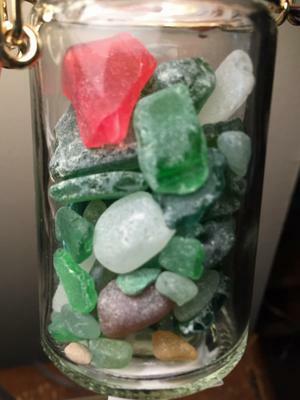 It sure was a great beach for sea glass treasures. Wow! Now that's one beach I would love to go wander along. 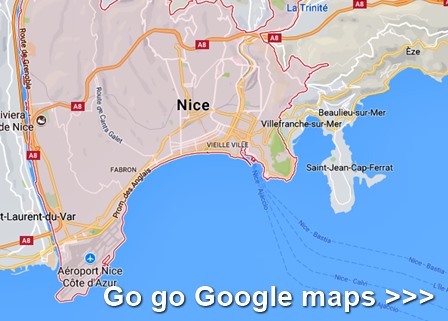 My daughter is currently holidaying in Nice and I have begged her to look for some little pieces of sea glass to bring home. Fingers crossed! Wow, what a nice "discovery." We need to put that on our list of beaches to visit in the future. Thanks so much for the good report.